Join the Class Struggle Contingent on May Day! Workers of the World, Unite! May Day is the international workers day. It should be a day of workers struggle against capitalism. 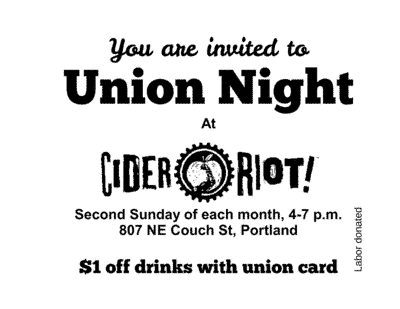 Join with Class Struggle Workers – Portland and the Internationalist Group to demonstrate for a revolutionary, working-class answer to the bosses’ racist system of poverty and war. Mobilize Workers Power: Strike Against Racist Police Murder! No to Sanders, No to Clinton, No to Democrats, Republicans, Working Families Party or Greens! Unionize Low-Wage Workers! Smash “Right to Work” Union-Busting! Defeat U.S. Imperialism! Drive U.S. Out of Syria, Iraq, Afghanistan! For A Class-Struggle Workers Party, for a Workers Government! On May 1, 2015, Local 10 of the International Longshore and Warehouse Union (ILWU) shut down the Port of Oakland, California and led a May Day march to “Stop Police Terror.” CSWP sent the following message of solidarity to Local 10. Class Struggle Workers – Portland salutes your decision to shut down the Port of Oakland this May Day in protest against the deadly epidemic of racist police violence. Only the multiracial working class has the power to resist and defeat the terrorism that capitalist America wages daily against black people and immigrants. Today you are setting a great example for the rest of the labor movement by using union power in defense of the besieged black population from Ferguson to Baltimore. 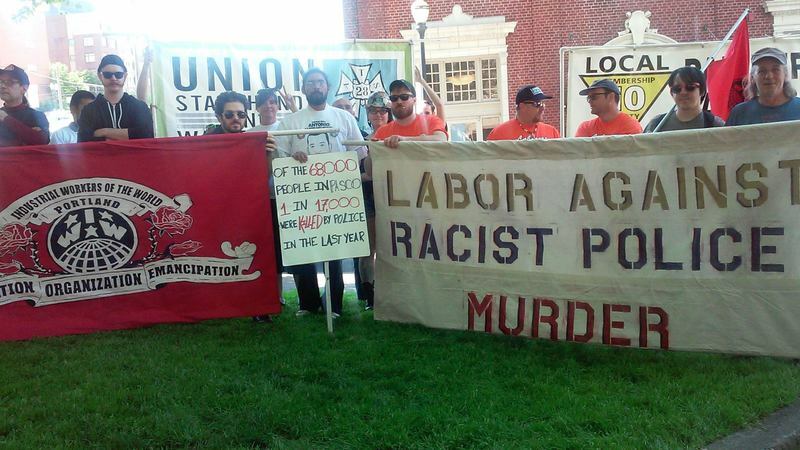 In Portland, Oregon, three local unions have condemned the racist murder of Antonio Zambrano Montes, a Mexican agricultural worker, by the police in Pasco, Washington. 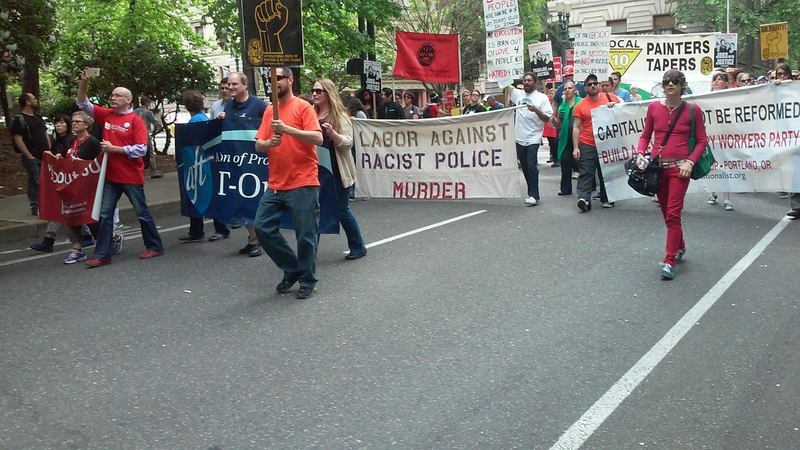 Your action has inspired these Portland union locals (IATSE Local 28, IUPAT Local 10 and IWW Portland) to form a contingent in the May Day march under the banner “Labor Against Racist Police Murder.” Anti-police-brutality protesters from Pasco will address the rally. Your courageous labor action, like the ILWU’s 2008 coastwise strike against the wars in Iraq and Afghanistan, and the 1999 work stoppage for Mumia Abu-Jamal, are shining examples that point to the only way out of what Malcolm X rightly called the “American nightmare” of endless war and barbaric racist oppression. Organized labor has the power, and must use it to strike against racist police terror, to fight for a society in which those who labor shall rule, where the nightmare of mass incarceration and police terror will be put in the past forever. 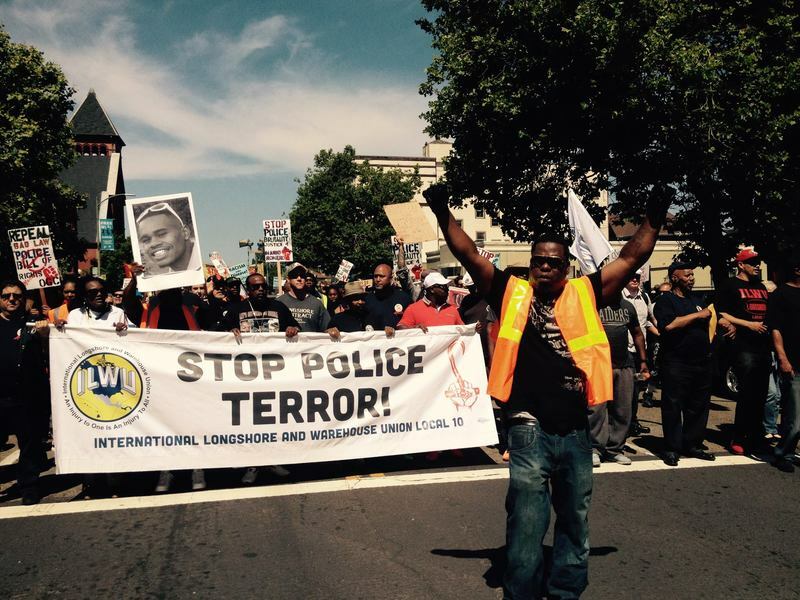 ILWU Local 10 marching against police terror on May Day 2015, Oakland, CA. On May Day in Portland Oregon, Class Struggle Workers – Portland initiated a union contingent behind the banner “Labor Against Racist Police Murder.” The IWW, Painters and Stagehands locals passed resolutions condemning the police murder of Antonio Zambrano Montes in Pasco, WA, and formed the contingent, which was joined by a delegation from Pasco, groups of Laborers and Teachers, and individuals from other unions.